In the spirit of reconciliation, we acknowledge and pay respects to the Traditional Owners and Elders - both past and present - of the land on which our five Australian campuses stand. 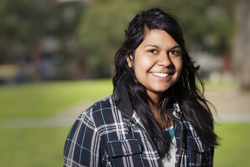 We offer culturally sensitive support throughout the application process and your studies at La Trobe. We have a range of scholarships open to Indigenous applicants. The La Trobe Business school hosts Getting down to business, an orientation for Year 9 to 11 Indigenous students, introducing them to the world of business. Get in touch with any questions about studying with us.